The government shut-down prevented CBP from releasing news stories about the cash seizure and customs enforcement activity. Now that the shutdown is over (for now), we have a new story from CBP in Laredo. In this case, as so often is the case in the cash seizures that occur along the U.S.-Mexico border, this story has the feel of the movement of cash in facilitation of the illegal drug trade. Isn’t there something suspicious about a 20 year-old woman driving a 9 year old car that has 53 bundles of cash in it? Yes, absolutely; it’s improbably. In this case, officers had more to go on than just their own suspicions, because the money was not reported. Not only was there a failure to report cash to Customs, but the money was likely smuggled (i.e., hidden) because the story implies that to find the cash officers had to use a imaging system scan and an intensive examination (this usually means they ripped off body panels and parts of the vehicle to locate the cash). LAREDO, Texas – U.S. Customs and Border Protection (CBP) officers Juarez-Lincoln Bridge recently seized nearly $1 million in unreported currency hidden within a passenger vehicle during an outbound examination. The seizure occurred on Friday, Jan. 25 at Juarez-Lincoln Bridge when a CBP officer conducting outbound examinations selected a 2010 Nissan Maxima driven by a 20-year-old female U.S. citizen for examination. After initial inspection utilizing a non-intrusive imaging systems scan, CBP officers conducted an intensive physical examination and discovered 53 bundles containing a total of $988,550 in unreported currency hidden within the vehicle. CBP officers seized the currency and arrested the driver. The case was turned over to U.S. Immigration and Customs Enforcement-Homeland Security Investigations (ICE-HSI) special agents for further investigation. Has Laredo CBP seized your cash? If CBP in Laredo has seized your cash, you need a lawyer. Read our trusted customs money seizure legal guide and can contact us for a free currency seizure consultation by clicking the contact buttons on this page. Dulles does it again, seizing $53,000 from two different people at the time they left the United States. In one incident, when stopped before leaving on a plane from the United States to Cameroon, a man reported having $26,000, but was found to have $36,668. In the other incident, a man and his family were leaving for Sudan. They reported having $11,000, but in fact, they had $16,500. In the first instance, the presence of “six envelopes” tells me that this man was probably carrying money back to Cameroon for other people, probably to help family members suffering Cameroon’s civil war. If that was the case, there’s probably a good chance he wasn’t told exactly how much was in the envelopes, leading to his under-report of the money. In the second instance, the fact that the family was traveling together tells me that — as almost always happens in my client’s cash seizure cases — someone did not count all their money, or did not consider some part of money to be required to be reported (i.e., an adult daughter traveling with a few extra thousand dollars of her own, not thinking she needed to report her money as part of the group because she’s an adult). These situations can be messy; sometimes money should be reported, sometimes not; it ends up being the word of the violator against the word of the CBP officer who seized the cash. In each case, though, once someone is boarding the plane and has not already voluntary made the report to CBP, a violation of the reporting requirements of 31 USC 5316 have already occurred. So whether the report was accurate or not is technically not important: by having to be prompted to report currency by a CBP officer while boarding a plane, you are as good as caught, because you obviously have the intention to not report the money in the small physical space between the ticket counter and the gangway. STERLING, Virginia — U.S. Customs and Border Protection (CBP) officers seized nearly $53,000 during two outbound currency examinations Thursday at Washington Dulles International Airport. CBP is not releasing the travelers’ names because none were criminally charged. While inspecting passengers boarding a flight to Belgium, CBP officers seized $35,688 from a Cameroon man who reported that he possessed $26,000. Officers discovered a combined $27,500 in six envelopes in a backpack, and an additional $7,500 in the man’s carry-on bag. Officers retained $34,000 and released $1,688 to the man for humanitarian purpose. While inspecting passengers boarding a later flight to Turkey, CBP officers seized $17,122 from a U.S. family bound for Sudan. The family reported that they possessed $11,000. Officers retained $16,500 and released $621 to the family for humanitarian purpose. In both cases, the passengers were released to continue their travel. Here is a tale from CBP of over a quarter-million dollars, unreported cash, seized by U.S. Customs officers at the Hidalgo bridge. He was arrested, which is not surprising. Although it does not say specifically how the money was hidden with the car he was driving, it does say that it was “concealed“. U.S. Customs and Border Protection, Office of Field Operations (OFO) at the Hidalgo International Bridge arrested a man from Reynosa, Tamaulipas, Mexico after the discovery of more than $300,000 in unreported currency concealed within the vehicle he was driving. On Sept. 28, CBP officers at the Hidalgo International Bridge conducting outbound examinations referred a vehicle for inspection. The vehicle was driven by a 43-year-old man, a Mexican citizen from Reynosa, Tamaulipas, Mexico. After a physical inspection of the vehicle, the use of a non-intrusive imaging system inspection (NII), officers discovered over $300,000 in unreported currency. CBP OFO seized the currency and arrested the man, who was turned over to the custody of Homeland Security Investigations (HSI) agents for further investigation. Baltimore CBP doesn’t make it into the news too much for cash seizures, but recently it was reported that they seized more than $11,000 from a Nigerian money leaving the country. The story is different from many in that he wasn’t flying commercial, but rather flying on a private aircraft. U.S. Customs and Border Protection seized more than $11,000 in unreported currency from a Nigerian man who departed the United States late Friday night aboard a private aircraft. While examining a passenger manifest from the departing flight, CBP officers identified a man with previous federal currency reporting violations. The man also failed to report any currency on this trip nor did he complete a financial reporting form as required by law. CBP officers conducted a compliance examination and discovered $11,647 in U.S. dollars, British pounds and Euros. CBP officers seized all the currency. Privacy laws prohibit CBP from releasing the traveler’s name since he was not criminally charged. The traveler was departing for London, England. CBP officers released him to continue his travel after officers completed the currency seizure. CBP in Dulles recently made a very large cash seizure from an airline passenger headed to Ghana. It is CBP at Dulles Airport’s third largest seizure since 2003. While conducting an outbound enforcement operation, U.S. Customs and Border Protection (CBP) officers seized more than $150,000 in unreported currency from a Ghanaian man on Saturday at Washington Dulles International Airport. The man, who CBP has not named because he was not criminally charged at this time, reported to officers that he possessed $10,000. The man reported that currency on a financial disclosure form and presented $10,000 in a zippered bag along with $200 and 100 Ghana cedis in his wallet. During a baggage examination, CBP officers discovered $40,000 concealed inside a pair of pants, and another $100,000 concealed inside a pair of sweatpants. The total currency the Ghanaian man possessed equaled $150,228. CBP officers returned $2,228 to him as a humanitarian release so that he may continue his travel. This is CBP’s sixth largest currency seizure at Dulles since CBP’s inception in March 2003, and the second largest currency seizure in the past 13 years. The top two currency seizures, of $318,519 and $303,031, occurred in 2003, and more recently, a $156,023 currency seizure in 2014 tops this seizure. If Dulles CBP seized your cash, beware that you stand to lose a lot of it because of their aggressive penalization of bulk cash smuggling and structuring offenses. You should read our trusted customs money seizure legal guide and contact our customs lawyer for a free cash seizure consultation by clicking the contact buttons on this page. I’ve had limited time to blog about customs law lately, but there was a large currency seizure out of Philadelphia reported about 2 weeks ago. At $93,000, it is among the largest of the run-of-the-mill failure to report/bulk cash smuggling cases that I’ve seen at the nation’s airport. Usually, these types of seizures are typically between $10,000 and $40,000, but sometimes larger; therefore, moving $93,000 out of the country likely took customs officers seizing the cash at the airport by surprise. U.S. Customs and Border Protection (CBP) officers seized more than $93,000 from a Qatar-bound family for violating federal currency reporting regulations Tuesday at Philadelphia International Airport. CBP officers conducted an inspection on departing international passengers and encountered a man, his wife and their five children. Officers explained the currency reporting regulations to the family and the father reported verbally and in writing that they possessed $12,000. During the inspection, CBP officers discovered a combined $93,393 concealed on the man’s, the woman’s, and their adult child’s bodies. CBP officers seized the currency. CBP officers returned $3,393 to the family and released them to continue their journey. So this airport seizure involved 7 people — a husband, wife, and 5 children. The phrase “concealed on . . . their . . . bodies” does not bode well for this family. Recall, the consequences a failure to report are less than when the offense involves bulk cash smuggling (i.e., concealing the cash with the intent of avoiding the currency report). Has Philly CBP seized your cash? If Philly CBP seized your cash, read our trusted customs money seizure legal guide and contact our customs lawyer for a free cash seizure consultation by clicking the contact buttons on this page. The link between smuggling cash and smuggling drugs across the border is not always apparent. In fact, the currency reporting requirement was enacted to trace money entering and leaving the country that has some illegal connection, such as illegal drugs, illegal weapons, tax evasion, etc. This is why there is no penalty or tax for carrying cash across the border provided that the report is actually filed. CBP officers at the Eagle Pass International Bridge on April 15 inspected a 1999 Ford Mustang, driven by a 30-year-old man from Lamar, Colorado, during outbound operations. After further inspection, officers found $16,152 unreported U.S. currency in a bag concealed under the passenger seat of the vehicle. Officers also found 5.5 grams of alleged cocaine in a plastic bag, 6.4 grams of alleged crystal methamphetamine in a plastic bag, 5.3 grams of alleged cocaine in a plastic bag, 17.3 grams of alleged cocaine in 54 capsules and 1.5 pills of Oxycodone. The driver was turned over to Homeland Security Investigations special agents for further investigations. CBP officers seized the vehicle, narcotics and the unreported U.S. currency. Read our trusted customs money seizure legal guide and contact our customs lawyer for a free cash seizure consultation by clicking the contact buttons on this page. 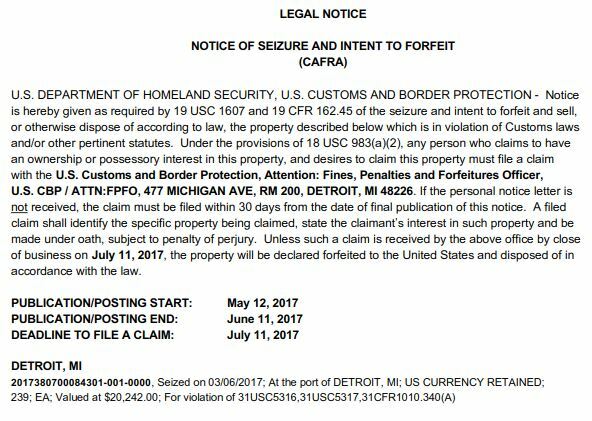 Last week’s forfeiture.gov publication of legal notices of seizure and intent to forfeit revealed more unfortunate news for someone out there who had their cash seized at Detroit Metropolitan Airport, as recently as March 6, 2017. Here’s why it’s unfortunate: If the money was seized on March 7, the notice of seizure was probably not sent until about March 21, which would give the interested person 30 days to respond with a petition (or 35 days to file a claim) — that puts a deadline at about April 6 for a petition, or April 11 for a claim. The fact that notice has been published means 1) somebody got their petition denied (unlikely in 30 days unless the documentation was terrible); 2) somebody filed a claim and requested notice be published (probably a bad decision — a long and and court supervised process leading to trial); or 3) no one responded to the notice of seizure, intentionally or unintentionally (because they did not receive it). It shows $20,242 was seized for a failure to report. Never, ever file a claim or a petition with CBP without first consulting with a lawyer (like me) who deals with Customs seizures first. Don’t use your immigration lawyer, and don’t use an attorney who has more experience with DOJ, FBI, or DEA cases. CBP is different, and most of the time, the cash seizure is for totally different reasons. CBP seized $185,000 in smuggled currency that was heading into Mexico out of Laredo, Texas, last week, in a story reported by CBP. The story has few details, but tells us that the money was apparently not hid too well because 16 bundles of currency were found after a “non-intrusive” inspection. What we do now is that the cash and vehicle was seized, and the two individuals in the vehicle were arrested. The rest of the story consists of “boilerplate” statements about the role of CBP in inspecting passengers, seizing currency, and the currency reporting requirement. U.S. Customs and Border Protection (CBP) officers assigned to work outbound inspection operations at the Lincoln-Juarez Bridge seized over $185,000 in U.S. currency in a single enforcement action over the weekend. The seizure occurred on Saturday, April 29, when a CBP officer referred a 2007 Mitsubishi Endeavor for an intensive inspection. The vehicle was driven by a 34-year-old Mexican male citizen from Monterrey, Nuevo Leon and a 33-year-old Mexican male citizen as a passenger also from Monterrey, Nuevo Leon. A canine and non-intrusive inspection by CBP officers resulted in the discovery of 16 packages containing $185,020 in U.S. currency. CBP officers seized currency and vehicle. The driver and passenger were arrested and the case was then turned over to U.S. Immigration and Customs Enforcement-Homeland Security Investigations (ICE-HSI) special agents for further investigation. Individuals are permitted to carry any amount of currency or monetary instruments into or out of the U.S., however, if the quantity is more than $10,000, they will need to report it to CBP. “Money” means monetary instruments and includes U.S. or foreign coins currently in circulation, currency, travelers’ checks in any form, money orders, and negotiable instruments or investment securities in bearer form. Failure to declare may result in seizure of the currency and/or arrest. If CBP seized your cash you need a lawyer. Read our trusted customs money seizure legal guide and can contact our customs lawyer for a free cash seizure consultation by clicking the contact buttons on this page. CBP discovered over a quarter-million dollars hidden in the right-rear quarter-panel of a Dodge Durango that was being driven out of the United States into Mexico. The story states the driver of the vehicle was arrested for a failure declare cash over $10,000, but pretty obviously, this was more about a bulk cash smuggling offense (which is also a criminal offense). CALEXICO, Calif. – U.S. Customs and Border Protection officers working at the Calexico ports of entry over the weekend intercepted $273,005 in unreported U.S. currency and discovered approximately $57,400 worth of methamphetamine in two separate smuggling attempts. The first incident occurred on Apr. 7, at around 8 p.m., at the Calexico East port of entry, when CBP officers conducting southbound inspections of travelers heading to Mexico stopped a 2001 white Dodge Durango. Officers referred the driver for a more in-depth examination. After an intensive examination that included an alert from a currency and firearms detector dog and use of the port’s imaging system, officers discovered 11 wrapped packages containing $273,005 in U.S. currency concealed inside the right rear quarter panel of the vehicle. The driver, a 60-year-old male and lawful permanent resident of the United States, was arrested for failure to declare monetary instruments in value of more than $10,000 and was turned over to HSI agents for further investigation. Theoretically, if the driver of the vehicle that the $250,000 cash was hidden inside of could prove that the money came from a legitimate source and had a legitimate intended use, he might be able to get some of the money back, even if he is criminally convicted. It’s not very likely, but it might be possible. The likelihood this could happen is reduced in bulk cash smuggling cases as opposed to failure to report cash cases due to the activity that is prohibited in the case of each law; in the case of failing to report cash, the prohibited activity is not reporting cash of more than $10,000. In this case of bulk cash smuggling, the prohibited activity is the concealing of cash with the intent to avoid filing the required cash report.